Doncaster Knights will be bidding to end the 2017-18 Championship season as they started it with a victory over Jersey. Knights recorded a 26-24 win over Jersey at St Peter on the opening day of the season and will be looking to complete their fourth double in the return at Castle Park tomorrow (3pm). Fifth-placed Jersey could finish as high as third or as low as sixth depending on the outcome of the game at Castle Park and other results involving Bedford, Cornish Pirates and Yorkshire Carnegie. The highest Knights can finish is sixth, which director of rugby Clive Griffiths admits is disappointing. “It’s not where we want to be or expected to be having won four of our first five league games,” said the Welshman this week. Knights suffered their biggest defeat during Griffiths’ spell in charge in their last game at Bristol a fortnight ago. “We have put it behind us and all we have focused on this week, since the players have been back in after taking a few days off last week, is Jersey,” he said. “We want to end the season with a win and I want us to be going to our presentation night tomorrow evening with a smile on our faces and not feeling glum. 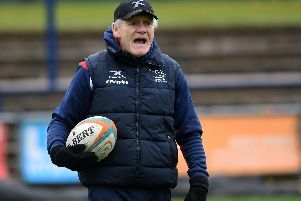 “Jersey have been on a good run in recent weeks and beat us in our B&I Cup quarter-final over there last month – though it was a closer game than 22-10 suggests. “They were just more clinical than we were. Centre Mat Clark will miss the game having broken a bone in his hand. Tomorrow’s game will be the last in Doncaster colours for a number of players, including scrum-half Michael Heaney who is joining Premiership side Worcester. Coventry-bound Jack Ram has already played his last game for the club having flown back to Tonga to attend a family funeral earlier this week.